In the Tasmanian Dam case the High Court considered some difficult questions about several important provisions of the Australian Constitution. Central among these was the question of the proper interpretation of the external affairs power of the Commonwealth Parliament. Section 51(xxix) of the Constitution empowers the Parliament to ‘make laws for the peace, order, and good government of the Commonwealth with respect to … external affairs’. What ‘external affairs’ precisely meant for Parliament’s power to legislate in relation to international agreements to which Australia was a party remained unclear and controversial in the early decades of the Court’s operation. In their famous 1901 Commentaries on the Constitution of the Commonwealth of Australia, Quick and Garran anticipated that the s 51(xxix) power may ‘prove to be a great constitutional battleground’ with ‘considerable speculation’ about its scope. In 1936 the High Court handed down the first major decision on external affairs and international agreements in R v Burgess  HCA 52. In that case the court took a broad approach to the scope of the power, with several Justices commenting — with some trepidation — on the huge breadth of subjects on which Australia had entered into international agreements and the difficulties of strictly defining the precise limits of the power. With the Tasmanian Dam case, the High Court clarified many — but by no means all — of the enduring uncertainties about the scope of the external affairs power, drawing on Burgess’s Case and the Koowarta decision handed down the year before (albeit with a slightly differently composed bench: Justice Aickin passed away and was succeeded by Justice Dawson, and Justice Stephen was appointed as Governor-General and was succeeded by Justice Deane). The Court held by a majority of four judges to three that under this Constitutional power, the Parliament could enact domestic legislation to give effect to Australia’s treaty obligations as a party to the World Heritage Convention. Following protests against the construction of the Franklin Dam, and the area’s placement on the UNESCO World Heritage List, the Commonwealth Parliament had passed a federal law — the World Heritage Properties Conservation Act 1983 (Cth) — and had made a declaration under it, that listed the Franklin–Gordon River as part of the Tasmanian Wilderness World Heritage Area. That federal law and declaration were both held to be valid under the external affairs power. Section 109 of the Constitution provides that a Commonwealth law on the same topic as a State law will override that State law to the extent of any inconsistency, which in this case meant that the federal act would override an earlier Tasmanian law — the Gordon River Hydro-Electric Power Development Act 1982 (Tas) — that was intended to support the construction of the Franklin Dam. The practical effect of the decision was to stop construction of the Franklin Dam, which now sat within a World Heritage Site, and, if built, would have destroyed a significant part of that area. For critics of the Court’s decision, the four Justices of the majority had instead destroyed Australia’s constitutional system entirely (see here). That view is of course hyperbolic. But it does reflect the divisiveness of the broader debate about the dam. It also reminds us of that unease about this potentially boundless power that can be read between the lines of several of the judgments in Burgess’ Case. The questions concern the validity of certain Commonwealth Acts, regulations and proclamations which have been brought into being for the immediate purpose of preventing the construction of the Gordon below Franklin Dam. They are strictly legal questions. The Court is in no way concerned with the question whether it is desirable or undesirable, either on the whole or from any particular point of view, that the construction of the dam should proceed. The assessment of the possible advantages and disadvantages of constructing the dam, and the balancing of the one against the other, are not matters for the Court, and the Court’s judgment does not reflect any view of the merits of the dispute. No lawyer will need to be told that in these proceedings the Court is not called upon to decide whether the Gordon below Franklin Scheme ought to proceed. It is not for the Court to weigh the economic needs of Tasmania against the possible damage that will be caused to the archaeological sites and the wilderness area if the construction of the dam proceeds. The wisdom and expediency of the two competing courses are matters of policy for the governments to consider, and not for the Court. We are concerned with a strictly legal question — whether the Commonwealth regulations and the Commonwealth statute are within constitutional power. 1983 was certainly not the first time a decision of the Court had made headlines or been an ongoing topic of public discussion. Nor was the Court until now uninterested in public understandings of its work: the previous Chief Justice, Sir Garfield Barwick, had made considerable attempts to improve public awareness of the Court’s work that coincided with its establishment in the new building in Canberra in 1980. Yet with that first release the Court foresaw that in the midst of a heated political debate that had divided the nation, its reasons for judgment could be easily misinterpreted or read as motivated by concerns about politics, policy or public opinion. Then as now, part of engaging with the public includes explaining why it is vital for Australian constitutional democracy that courts confine themselves to legal questions and arguments, even when deciding issues that seem so bound up in politics and values to those engaging in the public debate. To many outside the law it must often seem that the possibility of approaching any divisive, politically-charged issue from a purely legalistic perspective seems impossible, and those who invoke that perspective must surely be using it to cover their real, usually conservative, reasons. Explaining why that is (nearly always) mistaken, and why the Court decided as it did, is by no means an easy thing to do, even in cases far less complex than Tasmanian Dam. But in that spirit of public engagement, today every judgment handed down by the High Court is explained in short, understandable media releases, and many other courts around Australia follow similar practices (see further here). Dr Bob Brown, former Senator in the Federal Parliament and former leader of the Australian Greens, who worked for the Wilderness Society and was heavily involved in the campaign to save the Franklin Dam prior to the case. The Hon Michael Black AC QC, former Chief Justice of the Federal Court of Australia, who appeared as counsel for the Tasmanian Wilderness Society in Tasmanian Dam. The Hon Sir Anthony Mason AC KBE GBM QC, former Chief Justice of the High Court of Australia, who sat on the High Court during the case. In the interviews, each of these central figures offers their recollections of the case, and their reflections on its importance as a turning point for Australian law and society. Bob Brown recalls the early days of the Tasmanian Wilderness Society’s campaign to prevent construction of the Franklin Dam. The campaign began when Brown rafted down the Franklin River in 1975 with forester Paul Smith, and later trips to record film footage of the magnificent beauty of the river and the wilderness that surrounds it. When those images were broadcast to the then-new colour televisions in the lounge rooms of Australia, the campaign began to gather support from all across the country. In this interview, Brown recollects his experiences in the early days of the campaign right up to July 1983 when the High Court handed down its decision in a packed Brisbane courtroom. Interview with Dr Bob Brown. Michael Black, who retired in 2010 after almost two decades as Chief Justice of the Federal Court of Australia, was lead counsel for the Tasmanian Wilderness Society in Tasmanian Dam, taking instructions from Dr Brown during the two weeks of hearings before the High Court in May–June 1983. The Wilderness Society was permitted to appear before the Court as an amicus curiae. Black was to appear briefly but powerfully at the conclusion of the eight days of hearings before the Court, in which Robert Ellicott QC appeared for the State of Tasmania and Sir Maurice Byers QC appeared for the Commonwealth Government. In this interview Black recalls his experiences of the hearing and his submissions to the court on the final day, as well as his thoughts on the case’s significance. Interview with the Hon Michael Black AC QC. Sir Anthony Mason sat as one of seven Justices on the Tasmanian Dam case. Appointed in 1972 as a Justice of the High Court, Sir Anthony would go on to serve a total of 23 years on the High Court, including eight years as its ninth Chief Justice. In this interview, Sir Anthony explains the legal issues raised by the case, the arguments contained in the majority and minority judgments, and his views on the decision’s legacy in Australian constitutional law. Interview with the Hon Sir Anthony Mason AC KBE GBM QC. As with all controversial historical events, the truth about them quickly becomes a variety of perspectives, memories and recollections each disclosing different truths. Australian historians are yet to thoroughly cover the significance of the 1980s as a decade. But we can hope that as they begin to do so the many perspectives on the Franklin Dam controversy, the High Court’s role in Australian society, and public engagements with clarifications and changes in the meaning and direction of the Australian federation will all form prominent voices in that story. While Sir Owen may have been right in saying that few if any questions of fact are beyond the court’s powers of inquiry, he would have been wrong to think courts had an advantage over seekers of historical truth. History is rarely if ever reducible to questions of fact. In continuing the debate on the place of the Tasmanian Dam case in Australia’s history, we can be sure that its significance and its truth lives in the present. AGLC3 Citation: Martin Clark, ‘Remembering the Tasmanian Dam Case’ on Opinions on High (24 July 2013) <http://blogs.unimelb.edu.au/opinionsonhigh/clark-tasmanian-dam/>. Martin Clark is a Research Fellow at Melbourne Law School. The ‘Turning Points: Remembering Commonwealth v Tasmania (1983) 158 CLR 1’ symposium was convened by Dr Ann Genovese on 28 June 2013 at Melbourne Law School. It was co-hosted by the Institute for International Law and the Humanities (IILAH), the Centre for Comparative Constitutional Studies (CCCS), and the Centre for Resources Energy and Environmental Law (CREEL). It is the second in a series of two symposia in the Turning Points series, building on last year’s symposium ‘Turning Points: Remembering Koowarta v Bjelke-Petersen (1982) 153 CLR 16’. 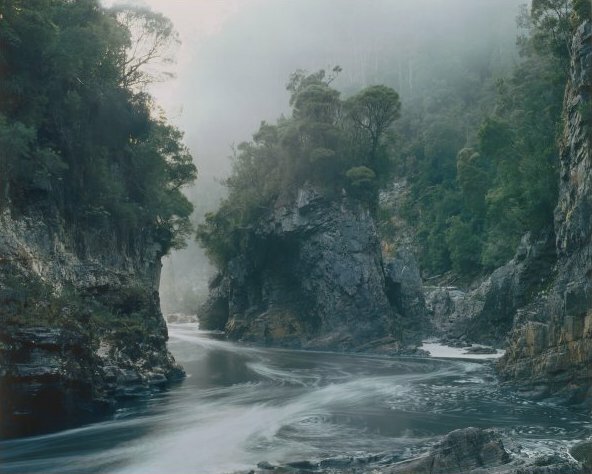 Peter Dombrovskis, ‘Rock Island Bend, Franklin River, Southwest Tasmania’ (1983) displayed with the kind permission of Liz Dombrovskis and the National Library of Australia, nla.pc-an6631500. ‘Michael Black and Bryan Keon-Cohen’ (Michael Black, personal collection). Damian Martin, ‘Portrait of Sir Anthony Mason’ (11 October 2005) displayed with the kind permission of the National Library of Australia, nla.int-nl39509-dmc2. This entry was posted in Features, Opinions and tagged Dr Bob Brown, external affairs power, Tasmanian Dam Case, The Hon Michael Black AC QC, The Hon Sir Anthony Mason AC KBE GBM QC by Martin Clark. Bookmark the permalink.